For the past four years Davidson student Michael Griffin has pursued an insatiable curiosity about coffee with the passion of a connoisseur and discipline of a scientist. He also stores about 30 pounds of green, unroasted coffee beans, bagged by the pound and labeled carefully to indicate the very plantation from which they originated in a dozen or so countries around the world. He brews some of those beans in his apartment as espresso or cappuccino for personal consumption. But he also subjects them to experimentation in Martin Chemical Laboratory as he seeks to discover the molecular components of the ultimate bean. “Research is imperative to the quest for better coffee,” he stated. This undergraduate chemistry major from Los Angeles is quickly becoming one of the foremost coffee experts in America. He has read scores of scientific papers about coffee, and spent the last two years conducting his own experiments in the lab. He has studied “latte art,” from some of America’s foremost “baristas,” learning from them how to pour heart and rosetta shapes into in the steamy foam of a cappuccino. He also worked for eight months as a barista in a Charlotte Starbucks, learning first-hand how coffee houses both educate consumers and compromise quality for commerce. He has held several “tastings” for campus friends, and many have gained a new appreciation for the common beverage. But Griffin is wary of spending too much time serving his friends. “If you convert them you have to make them coffee all the time,” he laughed. Griffin grew up in Los Angeles and began drinking cafe mochas at age 12. “I would have started earlier if I had known what I was getting into!” he joked. He became a serious aficionado of fine coffee in about 1995, then launched his career as a coffee scientist two years later when the coffee world was rocked by an amazing crop of Kenyan beans. The coffee harvested from the Kagumo plantation in 1997 carried an extraordinary amount of “brightness,” making it a very hot and expensive commodity. So nice, in fact, that his final paper is being published in a scientific report, The Proceedings of the 18th Colloquium of the Association Scientifique Internationale du Cafe. That initial investigation launched Griffin into a frenzy of scientific experimentation that has continued for almost two school years and during the past summer. He is now being funded by the Specialty Coffee Institute to conduct chromatographic experiments on coffee acids. He views that perfect brew with an artist’s eye, writing that it drips out of the porta-filter “like warm honey,” with a deep reddish-brown color, and a golden-red crema. He approaches coffee with a rare combination of enthusiasm and discipline. Griffin understands there’s a proper way to do everything, and applies that equally to his work in the lab and in preparing a cup to enjoy. It is just as important to him to keep his apartment coffee equipment sparkling clean as it is to maintain his lab apparatus. Measurement and technique are equally important in preparing a cup of espresso as they are in preparing coffee grounds to analyze with a gas chromatograph. 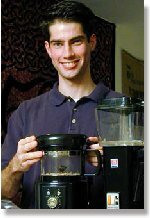 Griffin feels himself fortunate to live in a time of coffee renaissance, and is eager to find purpose and meaning in a career in coffee science. But as much as he loves the lab, he knows he can’t complete his education there. 4/4/00 Update: Michael was one of sixty students in the United States to receive the Watson Fellowship. He will be studying the art and chemistry of espresso in Brazil, Guatemala, Costa Rica, Italy, and Vienna. Bill Giduz is the staff newswriter and photographer at Davidson College, and takes his morning coffee sweetened and creamed with Half-and-Half.